A look back to the past. Our first stop on our trip was Venice, Italy. This is the original post. Venice is a wonderful place to visit. St. Mark's Square is amazing. The heart and soul of Venice, with palatial arcades and charming cafes. The Byzantine facade of St Mark's Cathedral was originally constructed in the 9th century and the gondoliers are standing around waiting for their next customer. There are many churches in Venice. Visiting the inside of exquisite Doges' Palace, the former residence of the dukes of Venice and the seat of the Venetian government for 800 years was fabulous. Climbing the Golden Staircase to marvel at the paintings of Tintoretto and Veronese and crossing over the Bridge of Sighs to reach the prison and view the cells was like stepping back in time. As the story is told. The prisoners would walk through the passages to their cells and would see the beautiful sight of the island of S. Giorgio and freedom for the last time. Venice is the most beautiful and romantic place I've ever visited! I loved all your photos! I loved Venice -- it was beautiful! And the Doge's palace -- marvelous! 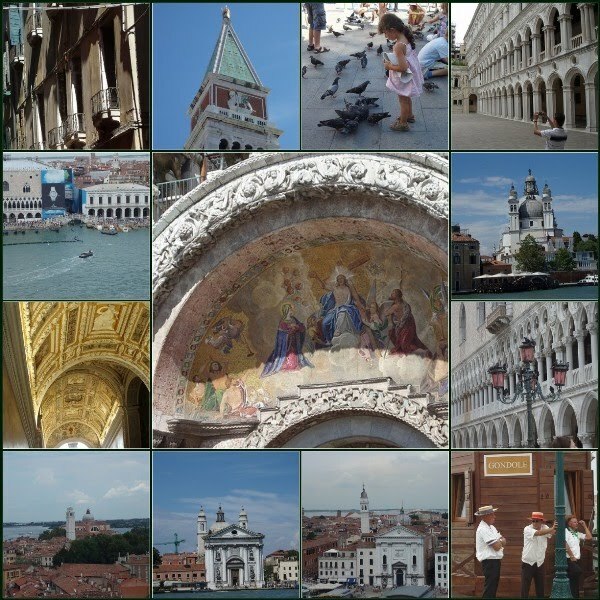 Loved the mosaic, I can't wait to visit Venice again this October...yes just around the corner!